Something miraculous happens when you put on a helmet and rest your fingers on the handlebars of an ATV. Cost: $105; $89 kamaaina; $70 for children ages 5 to 15. Includes snacks and drinks. Restrictions: Participants must be at least 16 to drive an ATV. Younger children may ride Rhino or a Mule with a guide or companion age 21 or older. Tour is not open to those who are pregnant or who have conditions that could be aggravated by off-road activity. Also: A four-hour Waterfall Picnic Tour is offered at 8 and 11:30 a.m. daily. Cost is $140; $118 kamaaina; $90 children. Private tours available for groups of at least four for an additional $50 per person. Your heart starts racing, your adrenaline starts pumping and you're suddenly as fearless as a teenager. Move a lever, press a button and the machine roars to life. Ruts, hills, branches, uneven terrain, even streams don't intimidate you. You're confident your powerful steed will carry you ably over every challenge nature presents. Kipu Ranch Adventures' three-hour Ranch Tour takes you all over Kipu Ranch, which is otherwise inaccessible to the public. You can make the trip solo in a fully automatic Honda ATV, travel with a companion in a Yamaha Rhino or join three others in a Kawasaki Mule. Expect to be jarred! Expect to get dirty! Expect to have the time of your life! A working cattle ranch, Kipu Ranch sprawls over 4,000 acres in the verdant southeastern area of Kauai called Kipu. Hawaiian royalty once owned this land, and it was a favorite summer retreat for Princess Ruth Keelikolani, a granddaughter of King Kamehameha I. In 1872, 26-year-old William Hyde Rice, son of Protestant missionaries, purchased this Kipu parcel from Princess Ruth for $3,000 to breed cattle and horses. Fluent in Hawaiian, he later served as Kauai's governor as an appointee of Queen Liliuokalani. Rice's son Charles started growing sugarcane at Kipu in 1907. Sugar remained the family's primary business focus until 1942, when their efforts reverted to ranching. During the Ranch Tour, you'll pass within a few feet of grazing Hereford and Brangus (Brahma/Angus mix) cows, calves and bulls. Don't worry about causing a stampede; they're used to ATVs (ranch cowpokes use them instead of horses for transportation), and will barely give you a glance as you whiz by. If you're lucky, you also might spot wild pigs, goats, turkeys, pheasants, cattle egrets and the endangered nene, Hawaii's state bird. 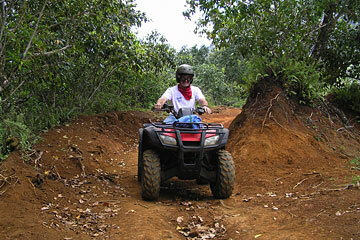 The Kipu Ranch ATV tour takes visitors over uneven ground to otherwise inaccessible sites, like a backdrop for "Raiders of the Lost Ark" and a cave where alii are said to be buried. Vistas stretch from Nawiliwili Bay to Huleia Valley to the Haupu mountain range -- spectacular scenes that served as backdrops for a host of Hollywood blockbusters, including "Raiders of the Lost Ark." In fact, during one break on the tour, you can swing off a tree branch on the very rope that Indiana Jones used to escape a mob of pursuers in that film's action-packed opening. Instead of landing back on shore, drop into the Huleia River for a quick dip, if you'd like. Guide Troy Shanks grew up in the area and knows all of its stories. At another stop atop a bluff, he'll point out the cliffs of Haupu where legend says the bones of alii are buried in caves. "The Hawaiians believe that a person's bones contain their mana, or spiritual power," Shanks said. "The alii didn't want the wrong people to get hold of that power so after they died, a trusted servant was given the task of hiding their bones in a cave high in the mountains. After doing that, the servant would cut the rope he had used to climb there and fall to his death. That way, no one would know where the alii's bones were buried." This lookout also offers a view of Menehune Fishpond. Some scholars believe the menehune came from the Marquesas and were the first to settle in Hawaii around 400 A.D. Although they stood no more than 4 feet tall, they were skilled engineers and conscientious laborers, and always completed their construction projects in one night. As the story goes, the king of Kauai asked the menehune to build a fishpond so he would have a reliable source of food. The menehune agreed to the job for payment of one shrimp each. The next morning, the king arose and was delighted to find his new fishpond. The wall measured 900 feet long, 4 feet high and 4 feet wide. Gates allowed young fish to swim into the pond, and as they matured, they became too big to swim out. "The king's servants would go to the pond, throw a net and catch the fish they needed for that day's meals," said Shanks. "In essence, ponds like this were the Hawaiians' refrigerators -- the first aquaculture system in the world." Interestingly, when scientists studied the specific type of rocks that were used to construct the fishpond, they couldn't find any nearby, but there were plenty of them in Waimea, over 20 miles away. According to Shanks, one theory suggests the menehune gathered the rocks in Waimea and passed them hand to hand along a human chain going partway toward Kipu. When the rocks reached the end of that line, the menehune repositioned themselves closer to Kipu and resumed passing the rocks. And so it went until they had what they needed to build the pond. "The rocks cut the menehune's hands, and when they rinsed them in the pond, it turned the water red," said Shanks. "The Hawaiian name for the pond is Alekoko, which means bloody ripple." Another scenic highlight of the Ranch Tour is a breathtaking panorama of Kipu Kai and its gorgeous crescent of white sand. Every beach in Hawaii is public, but since the land surrounding Kipu Kai is private, you only can reach this oasis by boat. "It's my favorite beach on Kauai because there's usually no one there," said Shanks. "Less than 2 percent of the people on Kauai have been to Kipu Kai. It's a real treasure -- one of the few places in the islands that hasn't been developed." Breaks are well-paced, and for safety reasons, groups travel single file at a speed that suits their comfort level. More daring drivers will want to push their ATVs to 25 miles per hour -- so, yes, even though bandannas and goggles are provided, it's likely you'll eat some dust. But it doesn't take long for you to realize that getting dirty is part of the fun of an ATV adventure; there's nothing demure about it. Don't try to swerve around potholes, rocks or branches on the trail; just drive right over them and relish the thrill of the ride. Said Shanks, "Sometimes we hear ladies tell their husbands, 'This is the first time you took me on an adventure that I enjoyed.' Most often we hear people say it was the very best part of their vacation!"